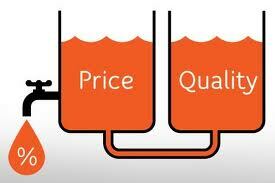 Home › Increase Sales › Increase Sales: Does Your Client Want Best Quality or Best Price? Your focus is to increase sales in your business. Should you improve the quality of your product or service to make it the best? Should you be more competitive and give your prospects the lowest possible price? You can try to do both but at some point you have to choose. Which would you choose? If you need to increase sales now it may seem to make sense to lower your price to close the sale today. Your prospect may talk about price a lot. They might even ask you “how much is it?” in the beginning of your presentation or before you even set an appointment with them. You hear a lot more about price on advertising and marketing than you will ever hear about quality products or services. They don’t talk about quality but what your prospects REALLY want is the best quality products to solve the problem they have. Is A “Great Deal” Always Great? One of my mentors used to tell a personal story to answer this…. My mentor and his wife at one time were looking for a phone system for his business. His wife found a used phone system and it was only 300 dollars which was a great deal for a 12 line phone system. My mentor asked his wife to make sure that the phone system had digital voicemail and other features. His wife called him and said that the phone system was in great shape and asked him if he wanted to buy it. He asked her if it had digital voicemail and the other features he wanted. His wife ignored him and said “It’s 300 dollars, if we don’t buy it somebody else will. Do you want me to buy it or not?” They bought it and it didn’t have digital voicemail or any of the other features he wanted so it was useless to them. In fact, last I heard the phone system is still sitting in his garage years later. It was a “great deal” at 300 dollars but it’s always better to pay a little bit more to get a quality product that solves the problem than it is to get a “great deal” that doesn’t solve your problem. You just have to spend more money to solve the problem another way. The truth is that your prospect wants their problem solved. Nothing wastes more time and money than low-quality products that don’t solve your prospects problem. If you want to increase sales you must sell a quality product or service. If you are not selling a quality product then you must find a quality product to sell as soon as possible. Increasing your sales long term is not going to be possible with a poor quality product or service. Once you have found a quality product or service to sell, you can increase sales by selling both best quality AND the best price. The price of a quality product is ALWAYS lower in the long run.